On recent walks around Greens Bush I have noticed quite a few juveniles learning the ropes from their parents. 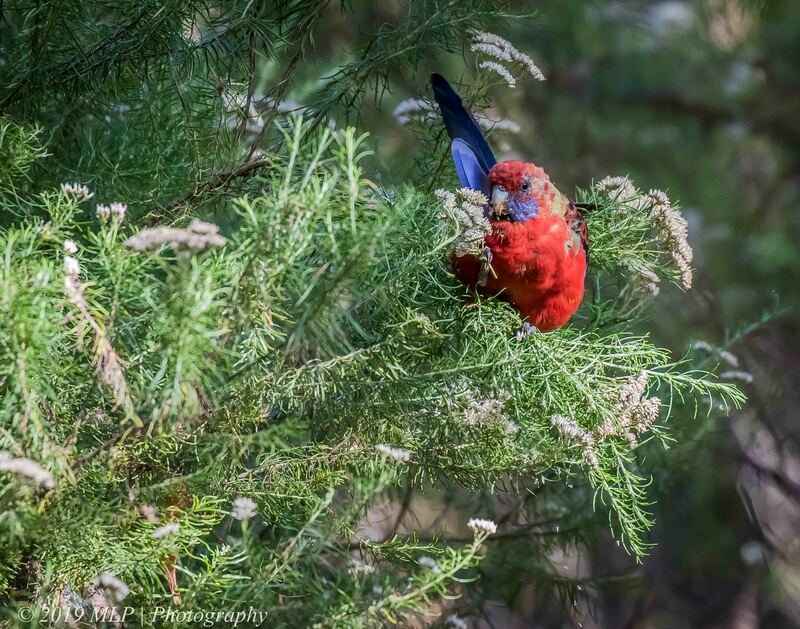 I found several Crimson Rosellas feeding in this flowering bush. The parents flew off but two juveniles stayed and kept feeding not overly concerned by me at all. This species in the wild is usually quite timid. 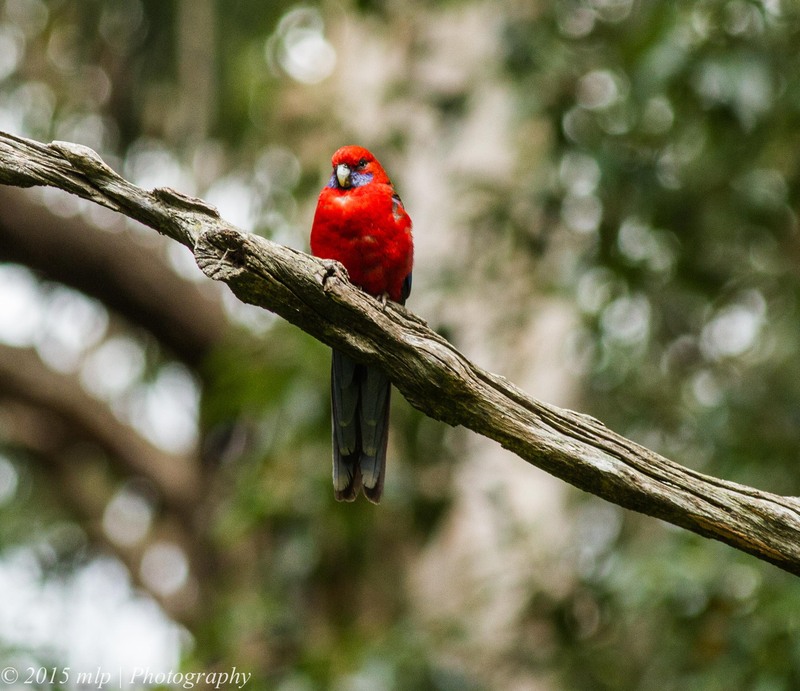 It is a good time of year for getting closer to the forest birds and taking photos. 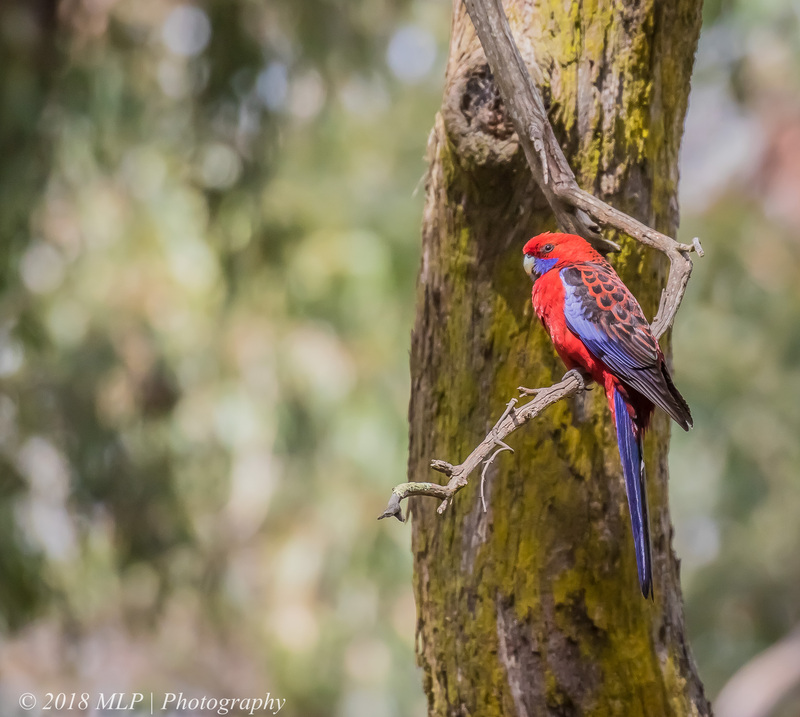 A brightly coloured Crimson Rosella flew down to a low branch next to the track I was walking along at Green’s Bush recently and started to preen. 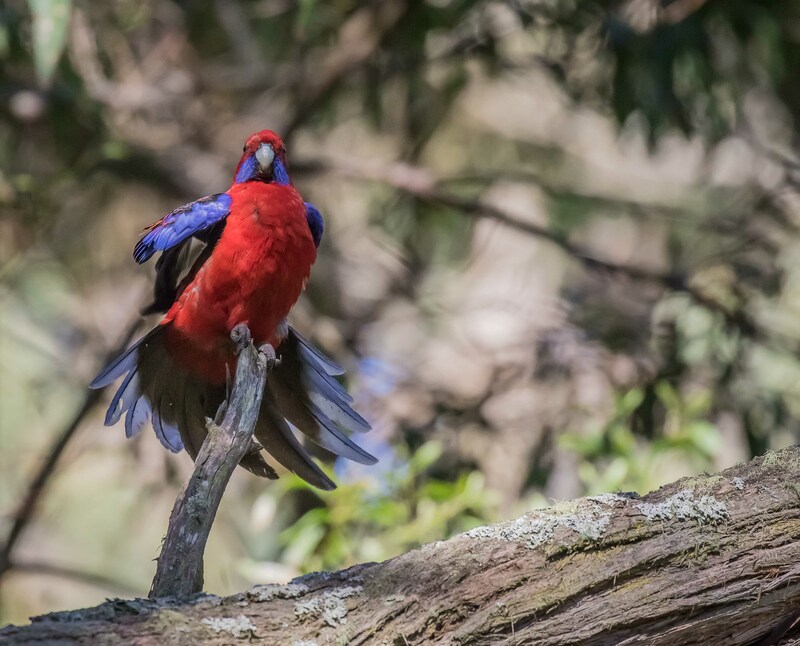 It finished with a vigorous shake of his tail feathers. It was all over in about 10 seconds and he flew off. I was lucky enough to get off a few quick action shots during the waggle. 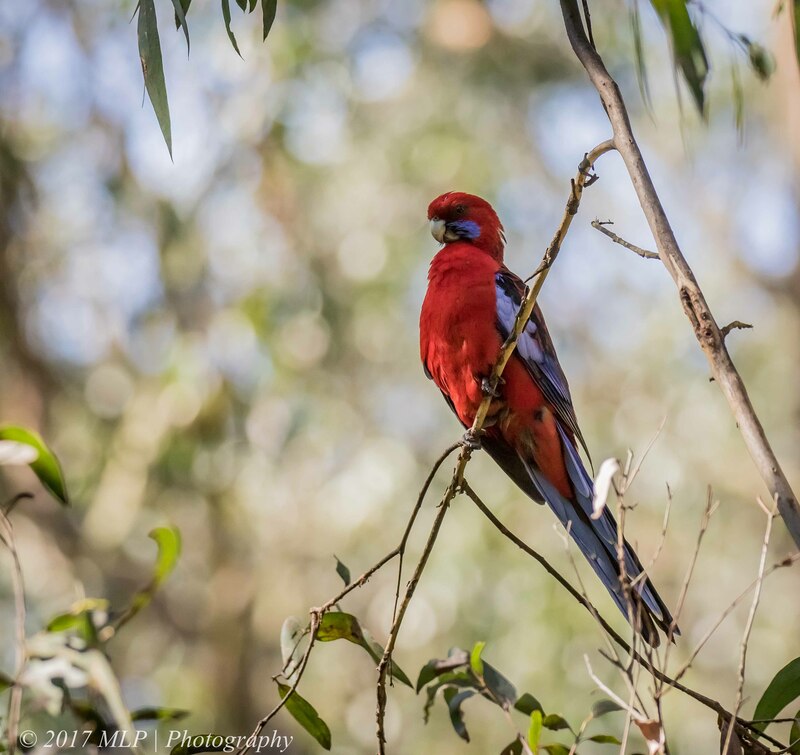 While walking around my usual Green’s Bush circuit I noticed many Crimson Rosellas exploring every tree hollow on the older growth Eucalypts. 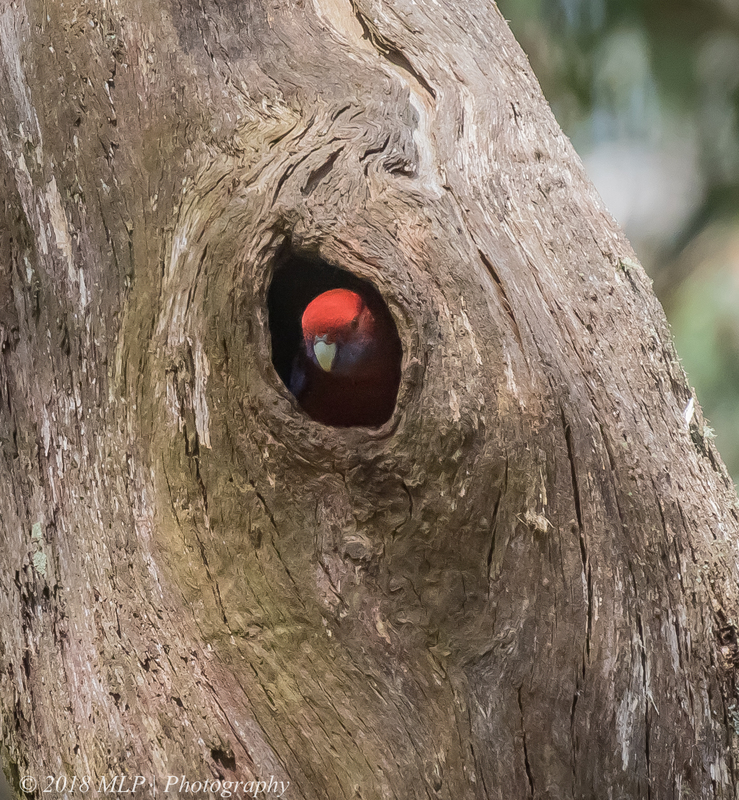 A few went right inside the various cavities after a cursory glance, and several flew off quickly when an occupant was discovered (most likely a brush tailed possum or sugar glider). I found a pair really giving this hollow a thorough inspection. 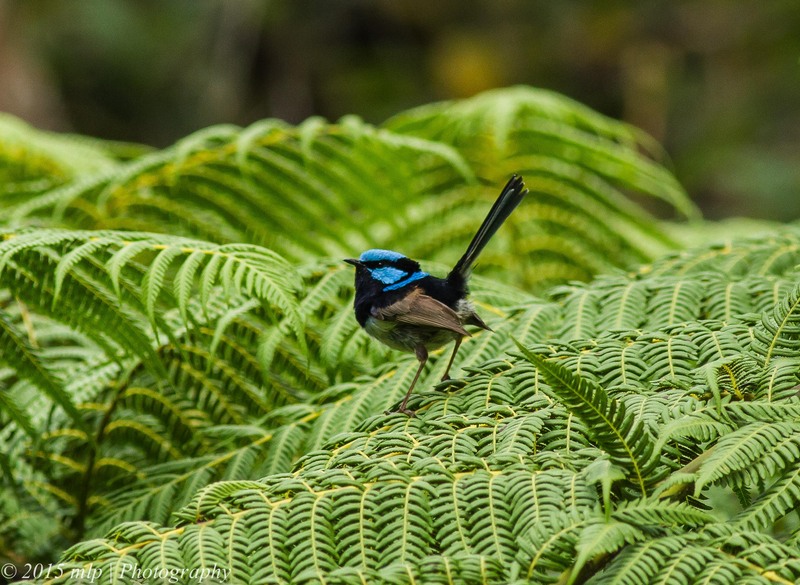 One did all the inspecting while the other stood guard on a nearby branch – he spent the time watching me on the trail and shaking his tail feathers now and again and quietly squawking. I assumed the other took this as a signal to be alert but not alarmed. 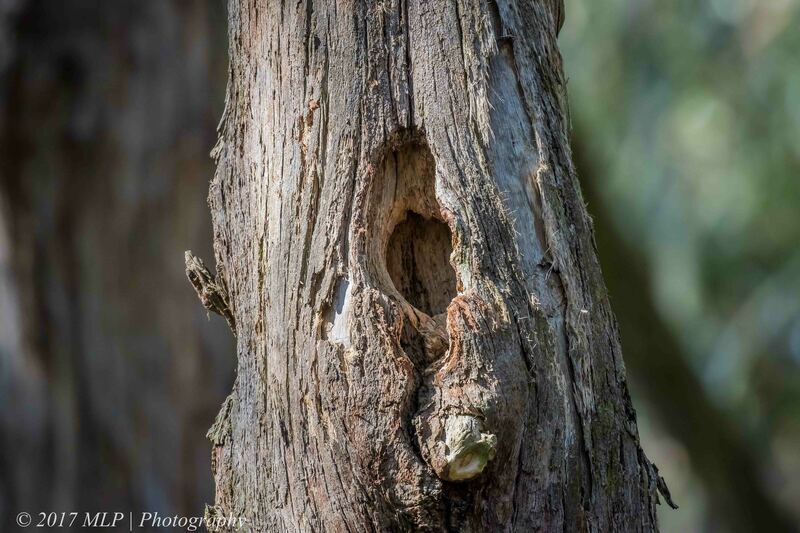 Potential nest hole – looking well used but too small for a possum. 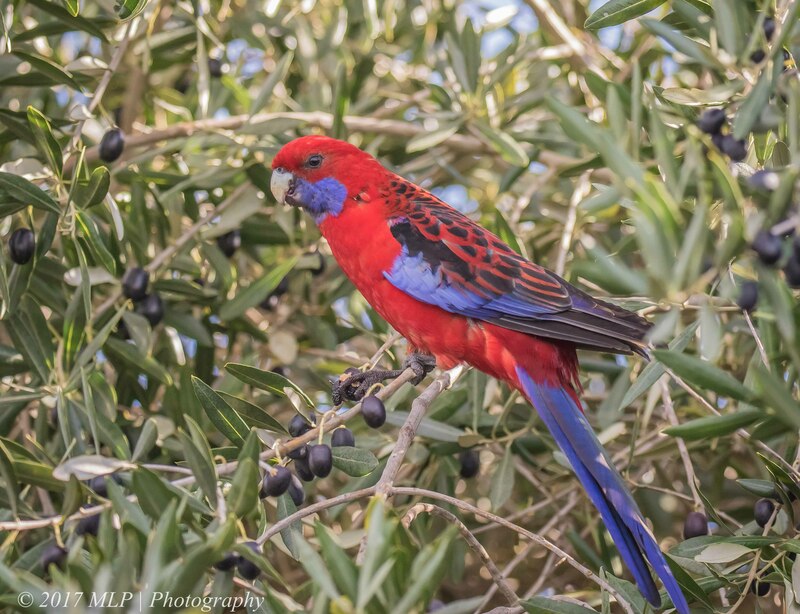 Once I harvested as many olives as I could process from our little front yard Olive Grove in Rosebud I left the rest for the birds. 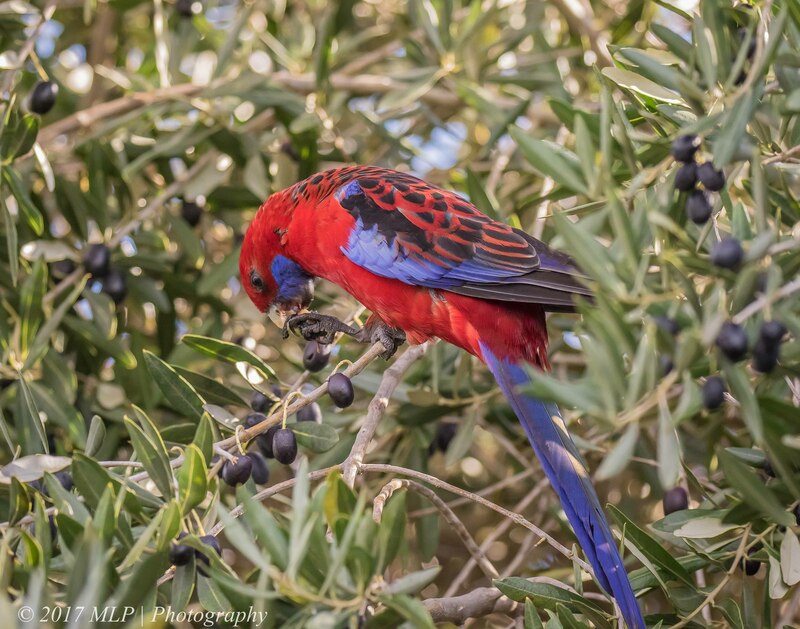 Previously I had not noticed many birds feeding on the olives. This year a number of species have enjoyed the late season fruit. 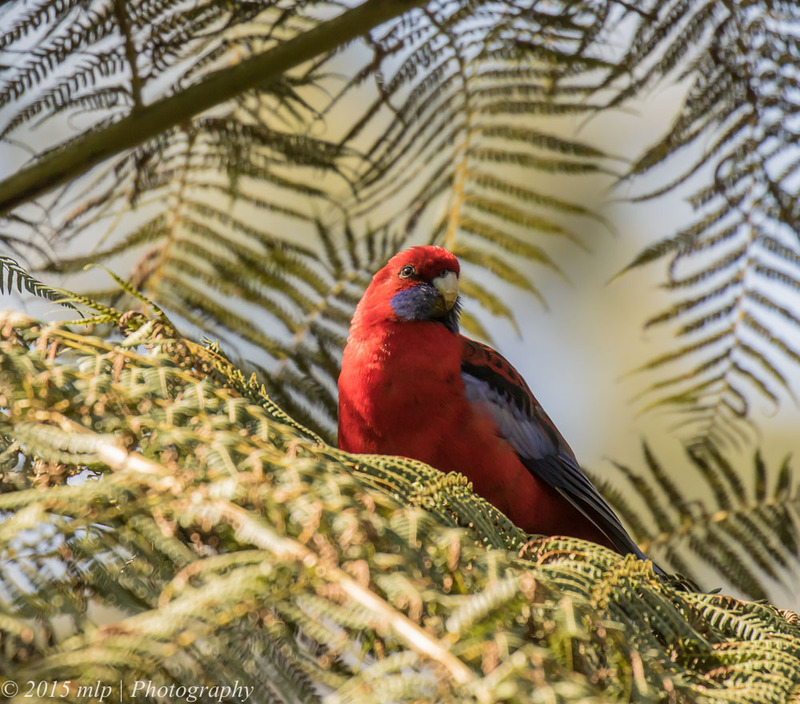 I have seen Sulphur-crested Cockatoos, Little Corellas, Silvereyes and now a pair of Crimson Rosellas. I was packing the back of my car only a few feet away and these guys just ignored me. The fruit is very ripe and starting to shrivel so must be quite edible even with their raw bitter flavour. I have read that most parrots/cockatoos are left handed. The fellow below was right handed, grabbing and eating the olives using his right foot. It was windy at times and he did very well to hang on and feed at the same time. 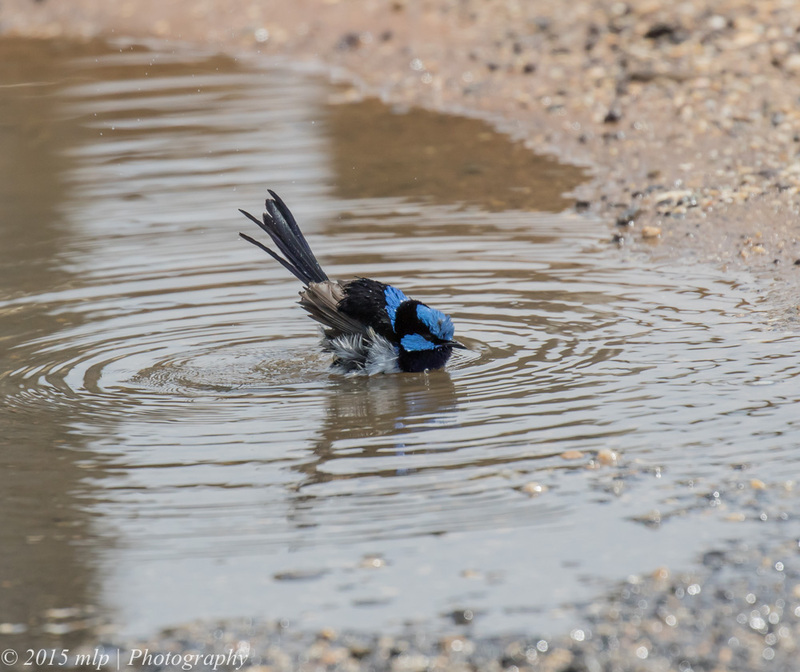 After a long rain storm at Point Addis, on the surf coast near Anglesea, I watched the birds come out and make the most of the rain puddles. 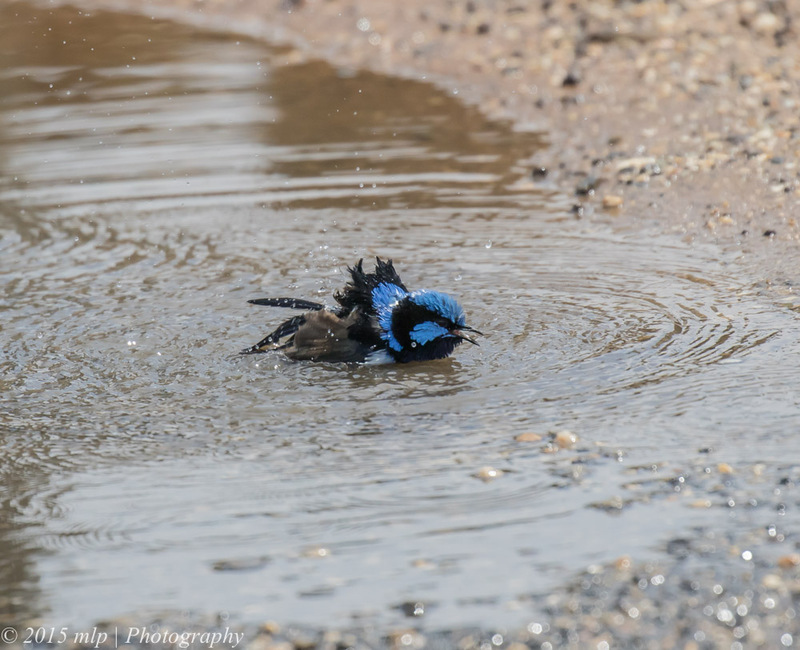 This little male Superb Fairy Wren was fully focussed on having a good clean. 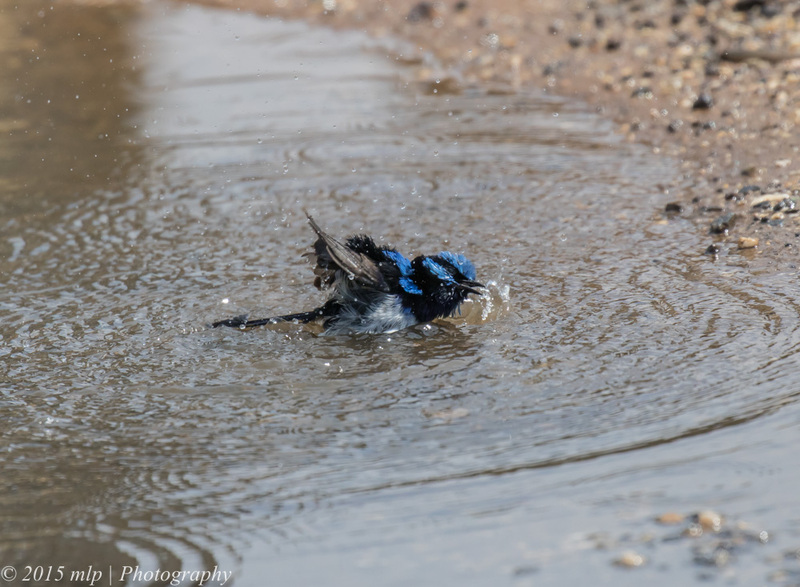 He would spend a minute or so bathing, fly up to a post, preen and then back into the puddle again. 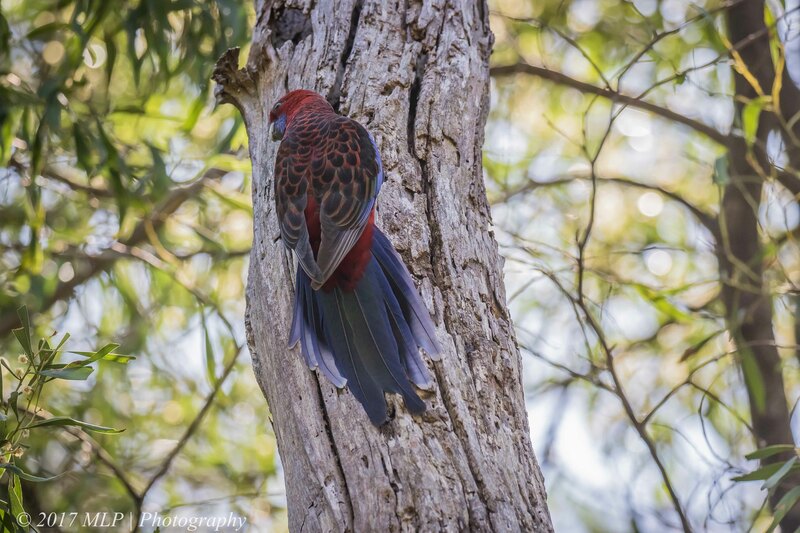 Takes a lot of work to keep your feathers in shape. 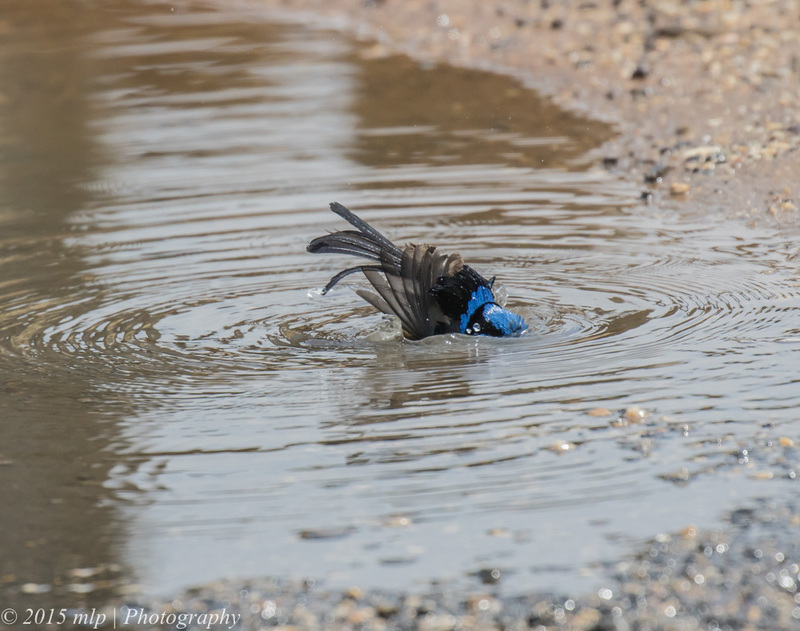 His female companion was much more nervous and only took a few quick flying dips. 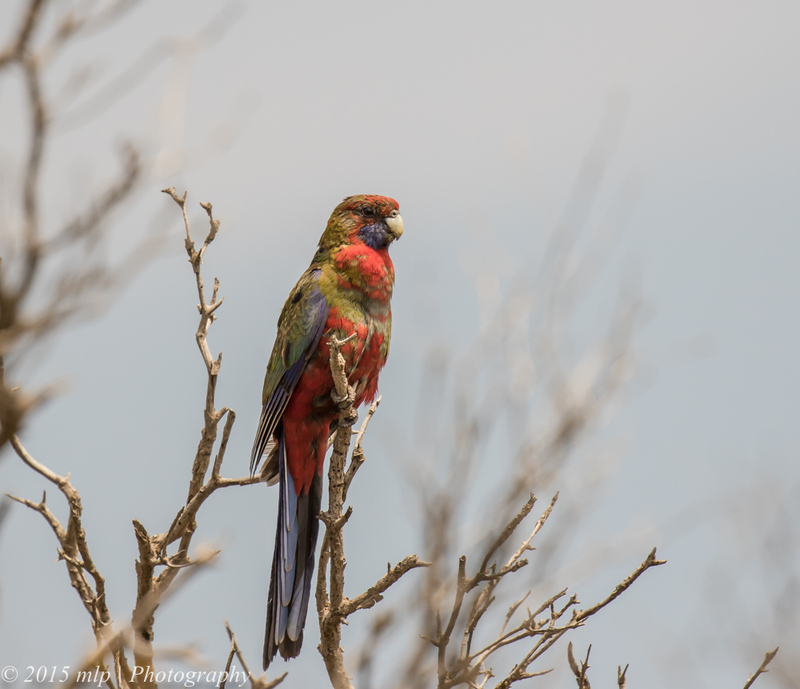 On some scrub nearby an immature Crimson Rosella watched the action. 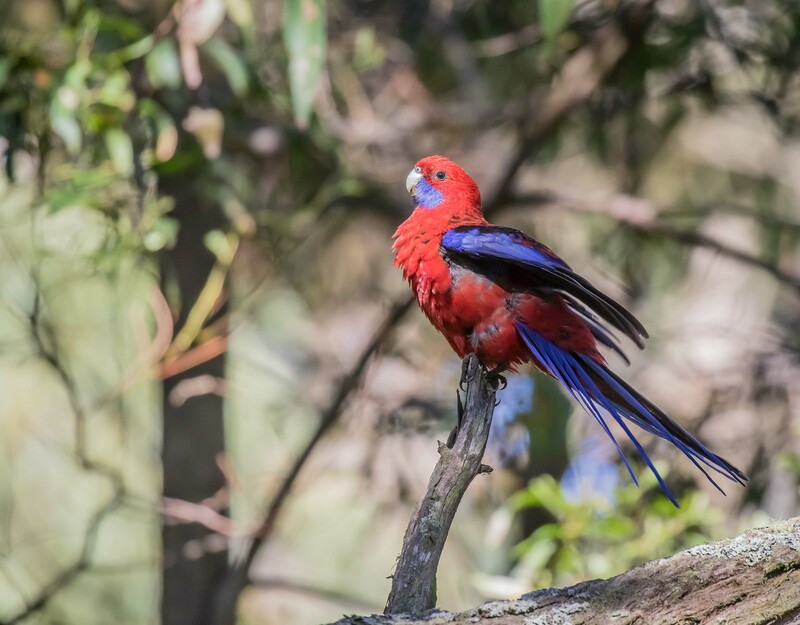 Over time his feathers will slowly turn a vibrant crimson. 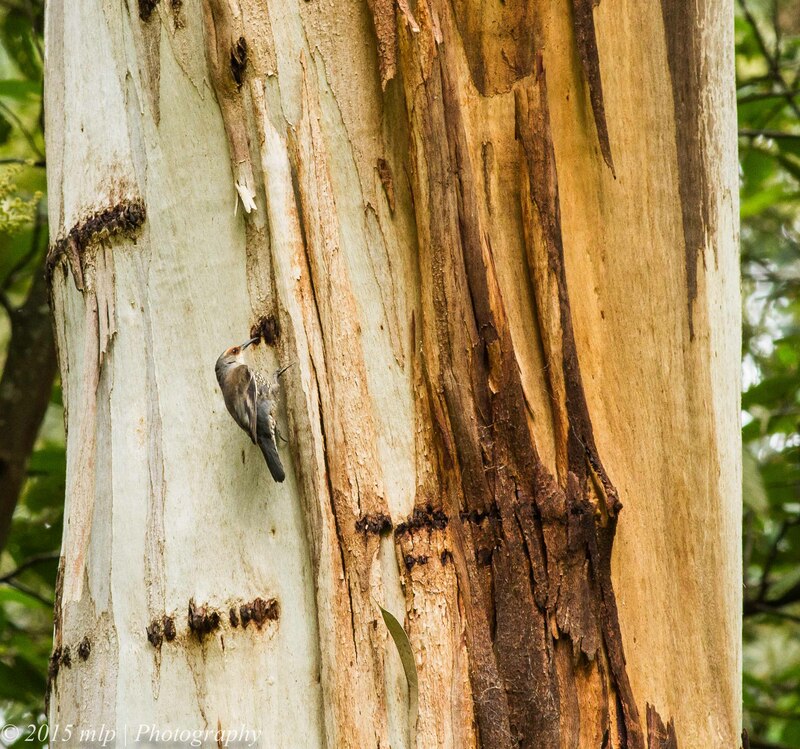 The mottled colours helps the bird stay camouflaged as they learn the skills required to survive. 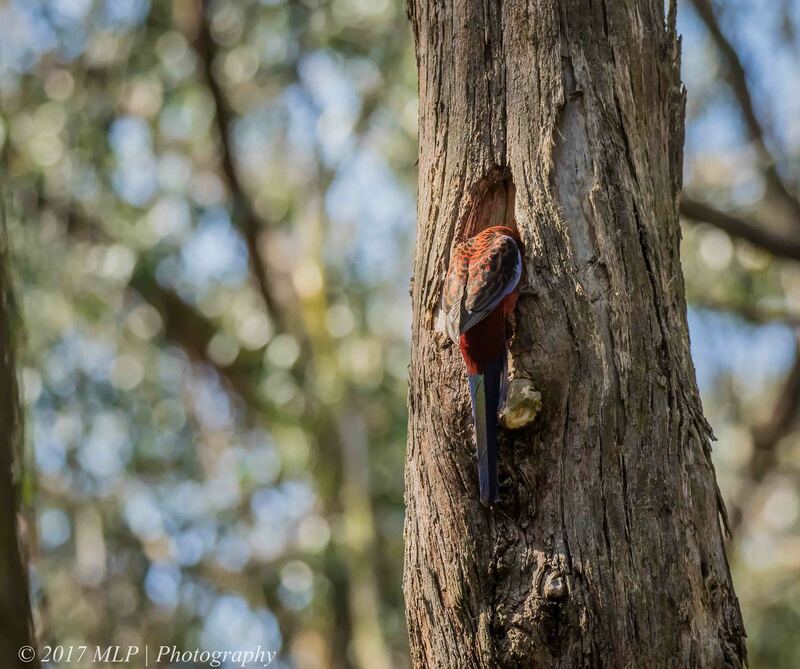 Unless they are in the open like the one below they can be very hard to see and find in the trees. 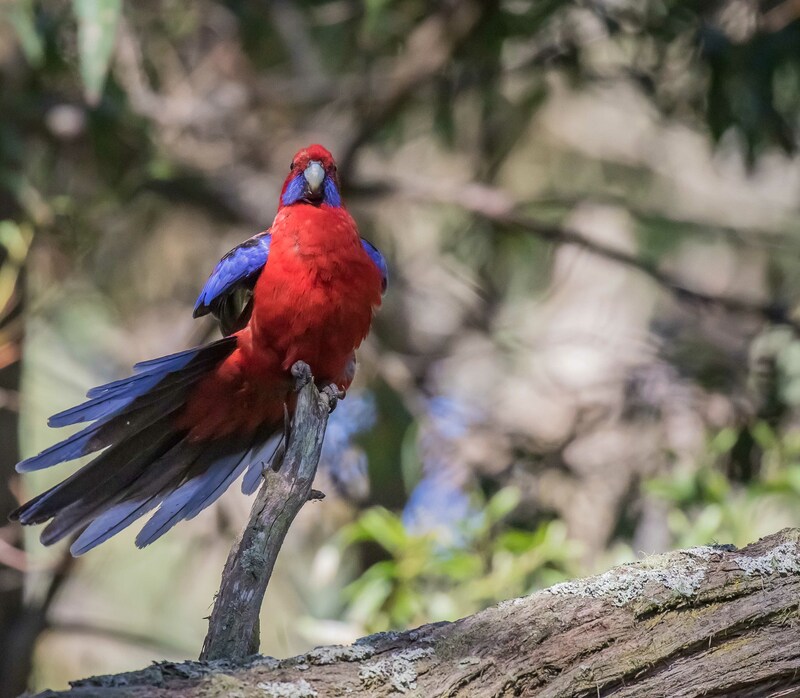 An example below of the bright colours of the adult Crimson Rosella, photographed a month back at Welch Track in the Dandenongs. 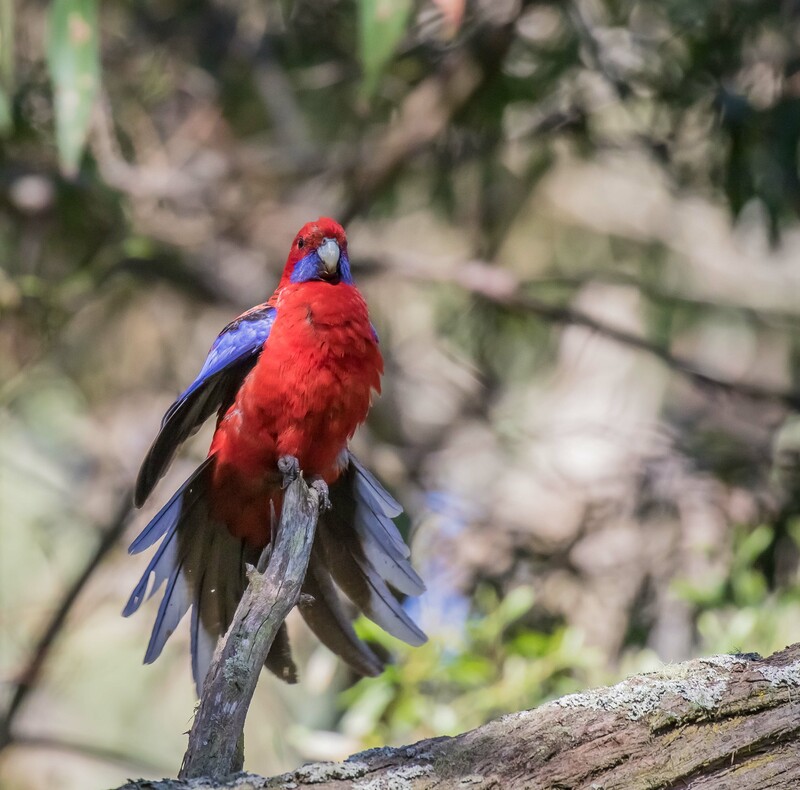 Another part of the Dandenong Ranges that I have explored briefly is a section near one of the Puffing Billy Steam Train Stations – Welch Track. 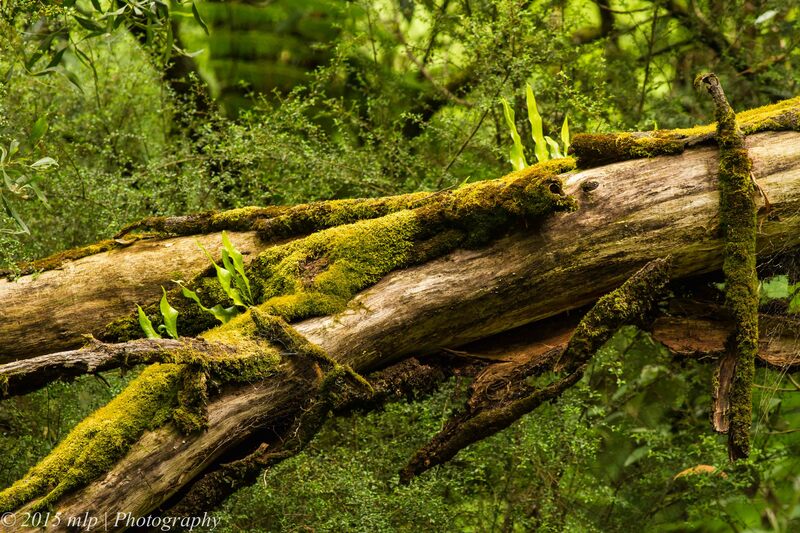 It is a rather steep section of the Park with a good track leading down to a rainforest gully and then merging onto other tracks. I had seen a report of a few Large Billed Scrubwrens in the area and while I looked for them I found a few other interesting birds along the way. 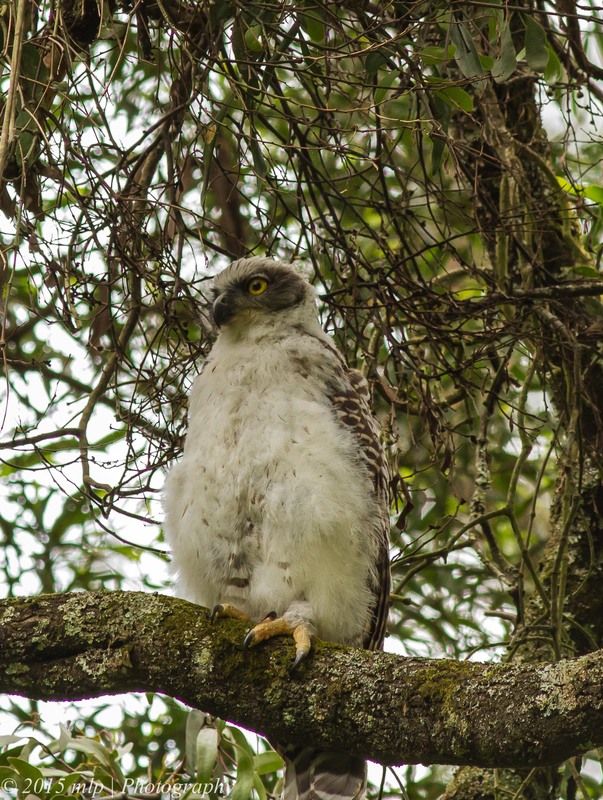 Juvenile Powerful Owl – still with fledgling white chest feathers, and already with extremely large and lethal talons. 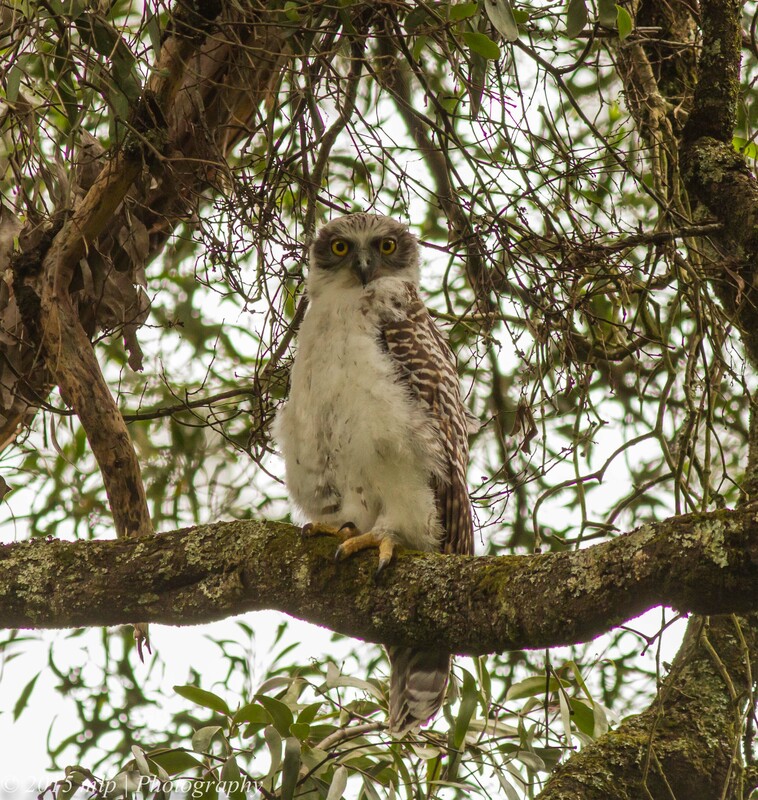 The Powerful Owl is able to take much larger and heavier prey – a favourite being the brush tailed possum. Even as a young Owl in daylight it had much better senses than I did – it knew when other people were coming down the track well before I did.